For the vast majority of people who have never heard of sleep hygiene, the term is probably a little confusing. When you think of hygiene, you think of things like showering after a workout; putting on deodorant before you leave the house; brushing your teeth at least twice a day; and other such actions of personal cleanliness. But the reality is that the textbook definition of hygiene is any condition or practice which helps you maintain health and prevent disease. While we're at it, here's another knowledge bomb for you: a failure to get a sufficient amount of quality sleep does, in fact, lead to disease. Practicing good sleep hygiene helps you get the quality sleep you need to avoid those diseases. So get ready to learn a little bit more about good sleep hygiene and prepare yourself to sleep like a baby from now on. If you're new to the whole sleep hygiene thing, you're going to want to start with the basics. 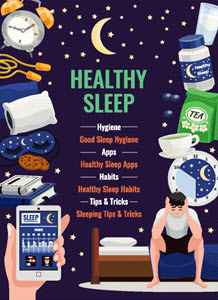 The better you get, the more detailed and complex you can make your nightly sleep hygiene routine. But for now, learning how to crawl before you learn how to walk is the best way to ease yourself into an effective and healthful sleep hygiene routine. Human beings have an internal body clock which, when left to its own devices, will make us feel wakeful in the morning and make us feel sleepy at night. This is because the natural blue light from the sun stimulates certain parts of our brains to send out a bunch of hormonal signals that tell the rest of our body "wake up, it's morning! Time to start your day!" When the sun goes down and your eyes are no longer exposed to that blue light, it triggers your brain to send the opposite hormonal signals of wakefulness. It's specifically triggers the major release of melatonin, more simply referred to as the "sleep hormone". You can find Melatonin supplements and more here at QuickVita.com, but that's only a small part of the total wellness plan. Unfortunately, modern invention has interrupted this process. Electronic devices - when used excessively at night - bombard your eyes with blue light which closely mimics sunlight. You may consciously know it's night time and that you need to go to bed, but your brain gets tricked into thinking it's still daytime and that you need to stay awake. So if you feel groggy in the morning and wide awake in the evenings, do what you can to flip that script. Get yourself more sunlight exposure during the day and stay as far away as you can from electronics late in the evening so that you can retrain your brain to release the right hormones at the right time of day. We promise you will start to experience better sleep. Aside from injury and excess, there's really no downside to working out. And getting better sleep is just one of the ways it can improve your overall health and wellness. Take young children, for example. They run around like little crazy people all day with seemingly boundless amounts of energy. Part of the reason for that is because they sleep better than we do. But why, exactly, do they sleep better than we do? There are a few reasons for this, but one of them is the fact that we encourage children to play and run around and exercise and burn off all of that energy. By the time the sun goes down, they are completely worn out and ready for bed. If you can squeeze a little more physical activity into your life, you will start experiencing similar benefits for yourself and your own sleep quality. You should start keeping better track of what you eat and drink, as well as when you consume your meals and beverages. You should also make sure to note down any supplements you are taking, whether they be QuickVita.com supplements or another brand. Caffeinated beverages and supplements should be avoided once your morning is over. These will stay in your system long enough to keep you feeling wide awake and alert by the time you're ready for bed, even if it doesn't feel like it. Spicy food can also disturb your sleep if you eat it too close to bedtime and the heartburn keeps you awake all night long. Fatty, sugary foods are known to cause a similar heartburn effect which is exacerbated by the horizontal position we sleep in. In general, the more hours you can squeeze between your final meal of the day and the moment you put your head on the pillow, the better it will be for your quality of sleep. You need to make sure you create an environment in your bedroom which is conducive to sleep. Otherwise, all of your helpful hygiene changes will be for naught. For starters, your bedroom has to be cold (or cool, at the very least). 68 Degrees Fahrenheit (or 20 degrees C) is considered the sweet spot, but energy costs could make this prohibitively expensive for a lot of people. Your bedroom should also be as dark as possible and should be free of the electronic devices we discussed earlier - high-def TVs, computers, and even your smartphone should be put away somewhere where you can't see the screen. Any other noisy distractions - pets especially - should be removed from your bedroom. You want to avoid any sort of unnatural chemicals or drugs when you're trying to help coax your body into sleep. Yes, they feel like they're effective; but what you can't feel while those pills are rendering you incapacitated is that they significantly disrupt your natural sleep cycle. They shorten or eliminate the most important phases like REM sleep and slow-wave Delta sleep. This can really hurt your health over time, especially that of your brain. It can also disrupt your metabolic hormones leading to weight gain, a growing waistline, and eventually chronic conditions like metabolic syndrome and diabetes. This is why it is so important to get natural sleep with an herbal sleep aid. These formulas are generally composed of safe, natural ingredients that don't have any side effects and don't require an expensive prescription from your doctor. They encourage your body to go through a natural sleep cycle each night, and some of them even help you get more of the REM sleep and the Delta slow-wave sleep you need for optimal health. Herbal sleep aids, along with a well-crafted sleep hygiene routine are the solution you need to help you get the sleep you deserve. This is why it is so important to get natural sleep with an herbal sleep aid like Avinol PM. The formula is composed of safe, natural ingredients that don't have any side effects and don't require an expensive prescription from your doctor. Avinol encourages your body to go through a natural sleep cycle each night, and it even helps you get more of the REM sleep and the Delta slow-wave sleep you need for optimal health. Avinol PM, along with a well-crafted sleep hygiene routine, is exactly what you need for the best possible rest. And you can get your supply of Avinol PM straight from us here at QuickVita.com.